We got inspired by our American friends and their use of smokey, sweet and spiced flavours in Southwestern meals. 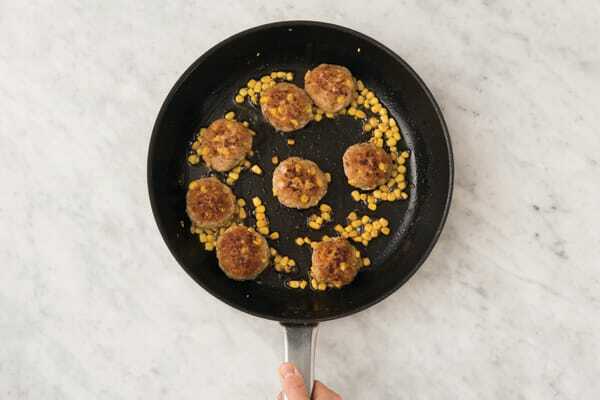 That’s why these rissoles are studded with corn and served with herbed wedges for a new take on dinner that will quickly become an instant classic. Preheat the oven to 240°C/220°C fan-forced. Slice the potatoes (unpeeled) into 1cm wedges. 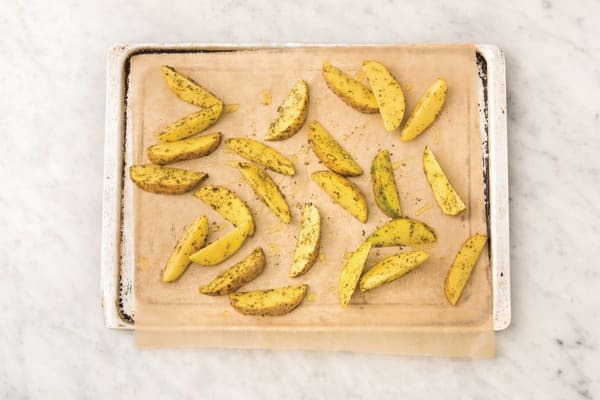 Place the potatoes and dried oregano (see ingredients list) on an oven tray lined with baking paper, drizzle with olive oil and season generously with salt and pepper. Toss to coat and spread out evenly over the tray. Roast for 25-30 minutes or until tender. TIP: Cut the potatoes to the correct size so they cook in the allocated time. While the potatoes are roasting, finely chop the garlic (or use a garlic press). Roughly chop the chives. Thinly slice the tomato into half-moons. 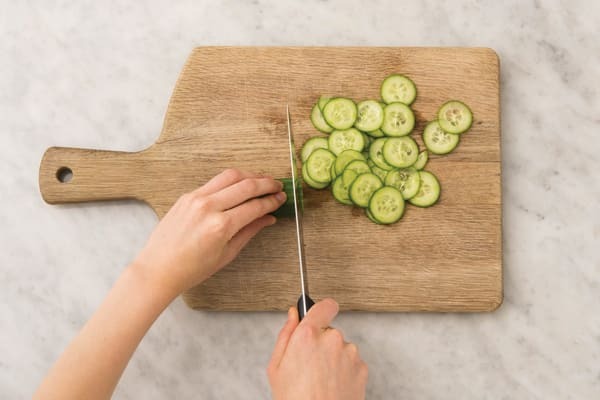 Thinly slice the cucumber. Drain the sweetcorn. In a medium bowl, combine the pork mince, fine breadcrumbs, egg, garlic, All-American spice blend, 1/2 the sweetcorn, the salt and a pinch of pepper. 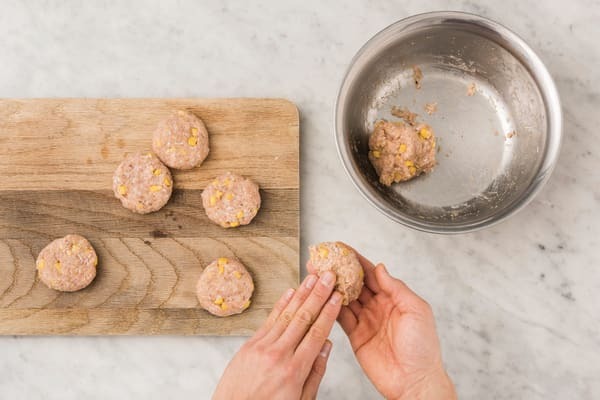 Take spoonfuls of the mixture, shape into a meatball then flatten into a 2cm-thick rissole. Set aside on a plate and repeat with remaining mixture. You'll get 4-5 rissoles per person. In a large frying pan, heat a drizzle of olive oil over a medium-high heat. Add the rissoles and cook for 4-5 minutes each side or until browned. In the last 5 minutes of cook time, add the remaining sweetcorn and cook, tossing occasionally, for 4-5 minutes or until golden. 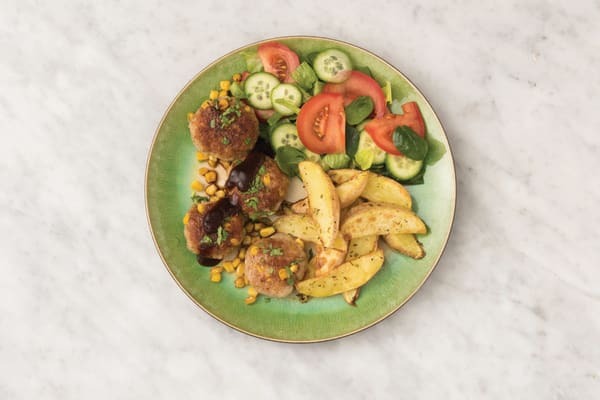 While the rissoles are cooking, combine the balsamic vinegar, honey and olive oil (2 tsp for 2 people / 1 tbs for 4 people) in a medium bowl. Season to taste with salt and pepper. Add the mixed salad leaves, tomato and cucumber to the bowl and toss to coat. 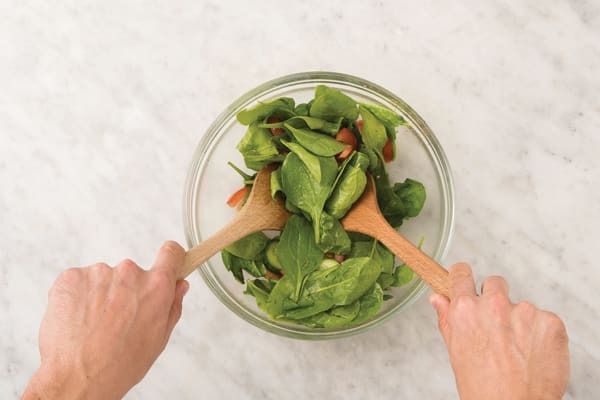 TIP: Toss the salad just before serving to keep the leaves crisp! 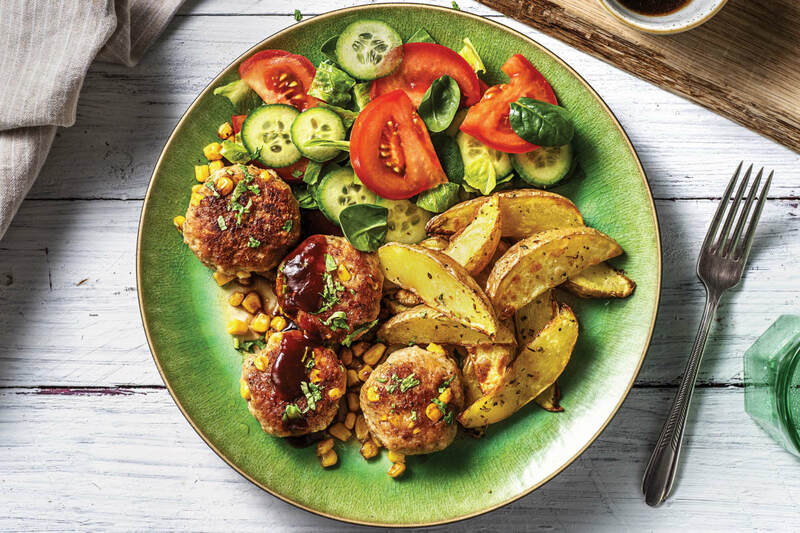 Divide the wedges, Southwestern pork rissoles and charred corn between plates. Spoon the BBQ sauce over the rissoles and garnish with the chives. Serve with the salad.